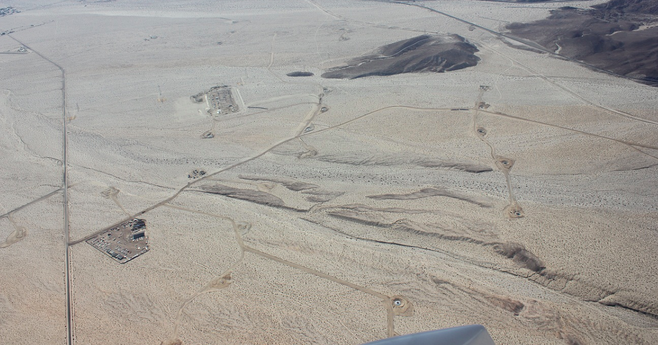 More desert damage from Ocotillo Wind Energy Project? On September 6, this photo was taken by Pam Wilmers in a private aircraft 5000 feet above a chain of sites carved into BLM land at the west end of Ocotillo Valley as part of the Ocotillo Wind Energy Project. The access roads and sites are a point of concern to residents because they run east-west directly across the natural drainage coming into the valley from the Jacumba Mountains. A group of village citizens will be attempting to obtain a temporary restraining order tomorrow, September 7, in San Diego federal court to stop the damage to the desert. The project is to include 111 towers almost 500′ tall along SR-2 where I-8 enters the Imperial Valley.